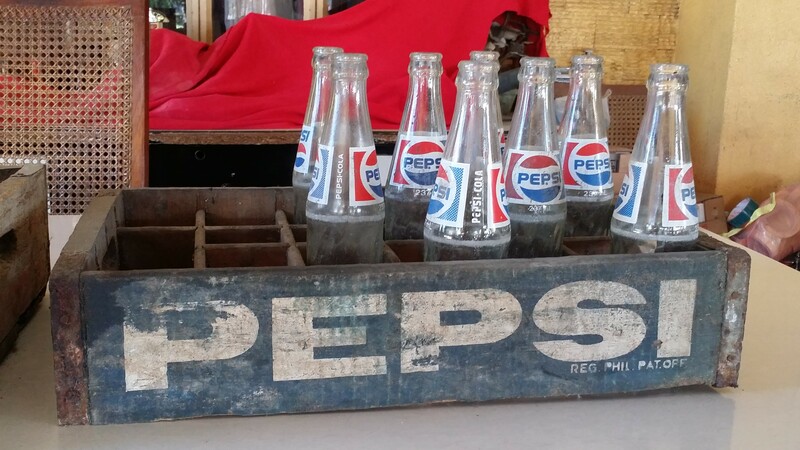 Vintage Pepsi Cola Bottles are also collectible items here in the Philippines. The Pepsi Cola brand first came here in the Philippines on October 16, 1946. Jordan Clarkin who is a native of Minnesota was the one who brought it here. At the same year he also obtained a franchise to bottle Pepsi here in the Philippines. And he was also its first president and general manager. For a year Pepsi was imported from The U.S. and in 1947 the first bottling plant of the Pepsi cola brand was opened in Quezon City. When Clarkin came back to the U.S. in 1957, Pepsi Co. took over the operations here in the Philippines. In 1985 Pepsi Philippines became a Filipino Corporation when the Pepsi-Cola Distributors of the Philippines led by the Escaler clan acquired franchising and bottling rights. In 1989 Premier Beverages under Luis Lorenzo Sr. and the AFP-RSBS assumed majority ownership of the company and renamed it Pepsi Cola Products Philippines. 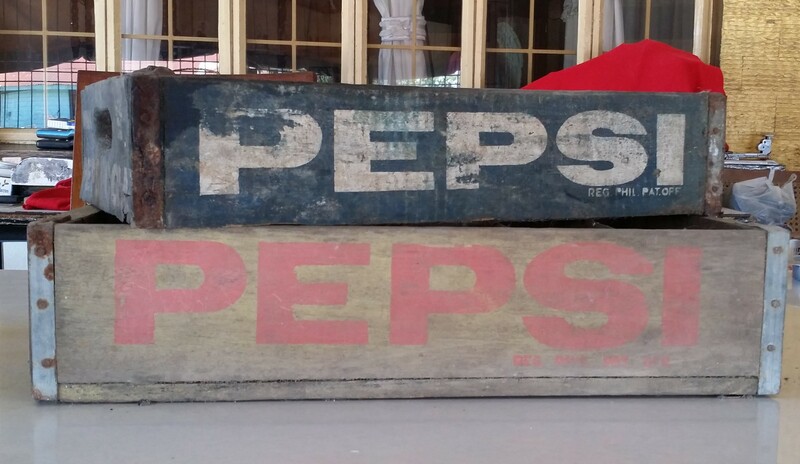 As you can see Pepsi has a long and rich history here in the Philippines. That is why many people here also collect their bottles. 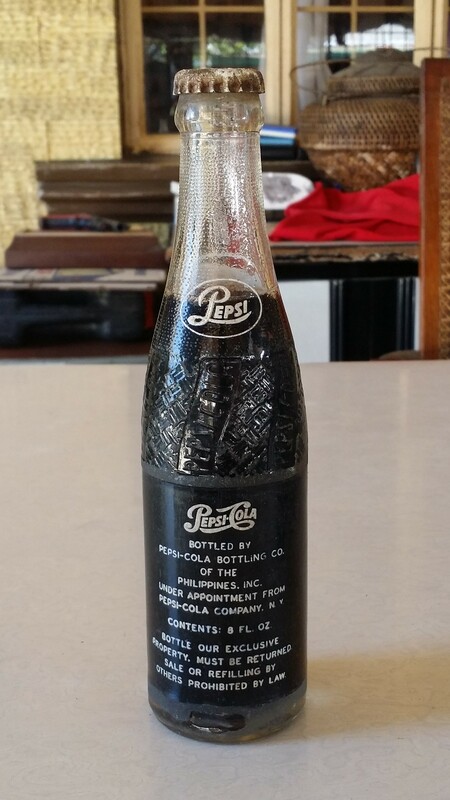 You can see the different designs and themes that Pepsi used to bottle their cola that is appropriate for their time. Also vintage collectors specially bottle collectors has a sense of joy and fulfillment when they collect each and every bottle of a certain product. 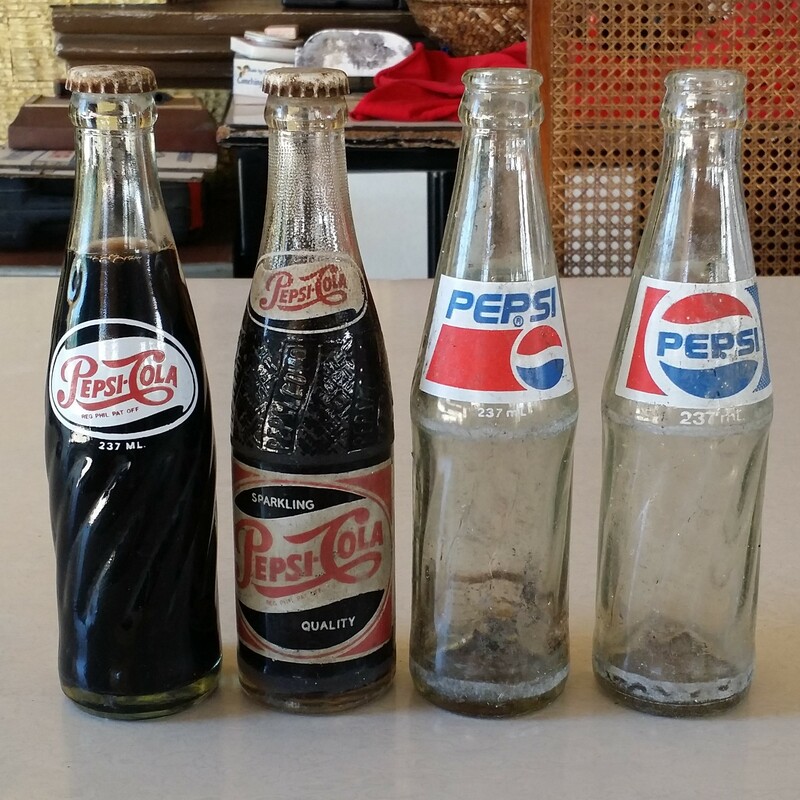 As you can see above I was able to get my hands on four vintage Pepsi Cola Bottles. Each one of them came from different eras and each one has a story on how I was able to acquire them. 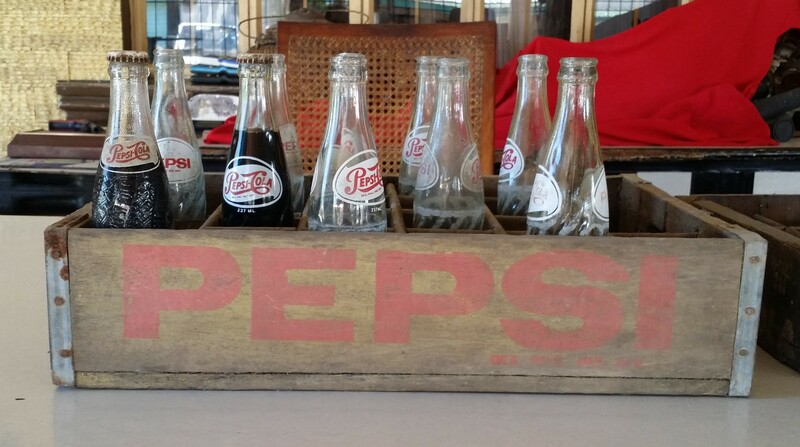 The one above is my oldest Vintage Pepsi Cola Bottles. It is the only one that I have. It was brought to me by one of my magbobote (worker.) I asked where he found the Pepsi soda bottle he said that his regular customer asked him to clean her backyard. As he was cleaning it there were different kinds of old bottles just littering on the ground. He asked the woman how come there were many old bottles. She said that her grandmother had a sari sari store (mini mart) before and they sold different soda bottles before. And the ones that was on the ground were just left there. He asked the woman if he can have them and she happily gave them to him. 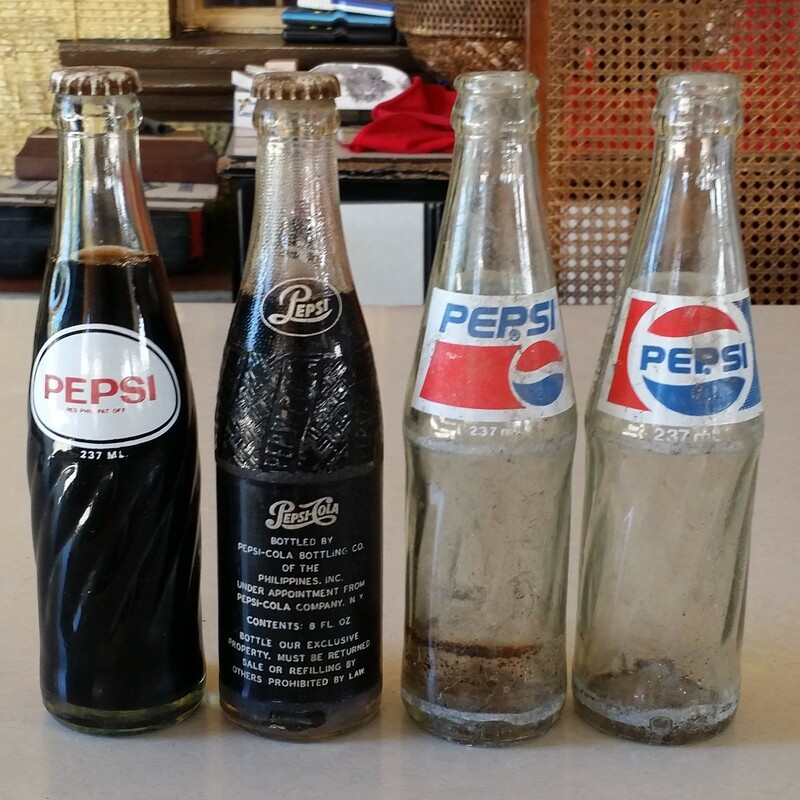 I only needed to clean the vintage Pepsi cola bottle because soil was sticking to it due to it being on the ground for a long time. 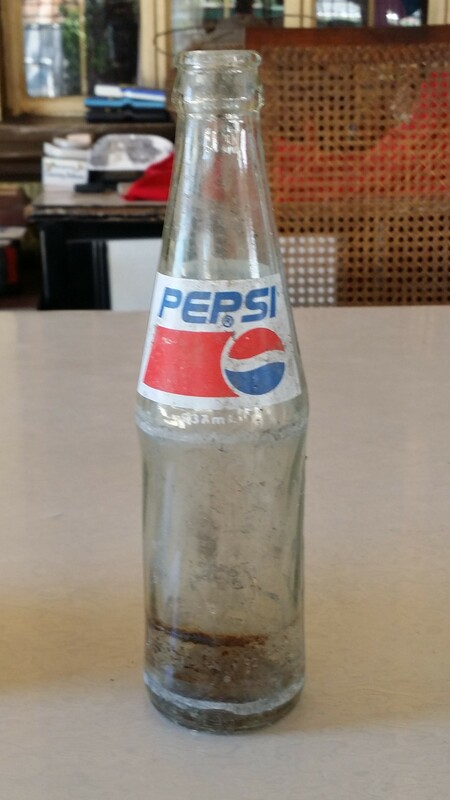 The Pepsi soda was still there and even the bottle cap was still intact but has some rust to it. 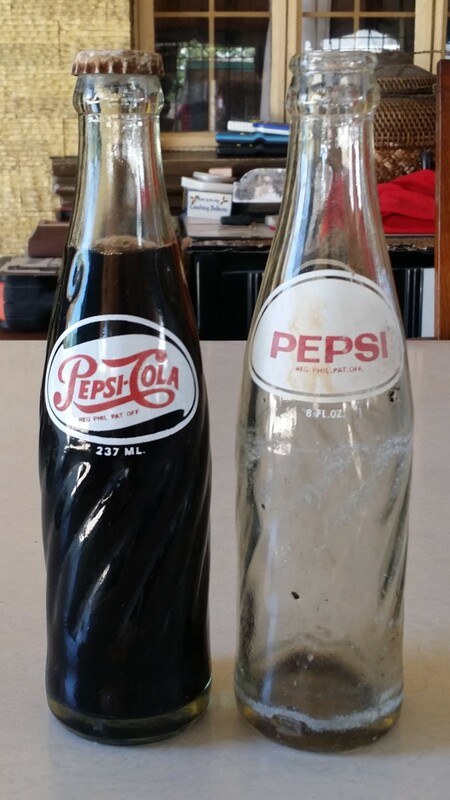 For me it is a great find because I hardly see vintage Pepsi Cola Bottles like this anymore. The second vintage Pepsi Cola Bottles that I got is the one from above. 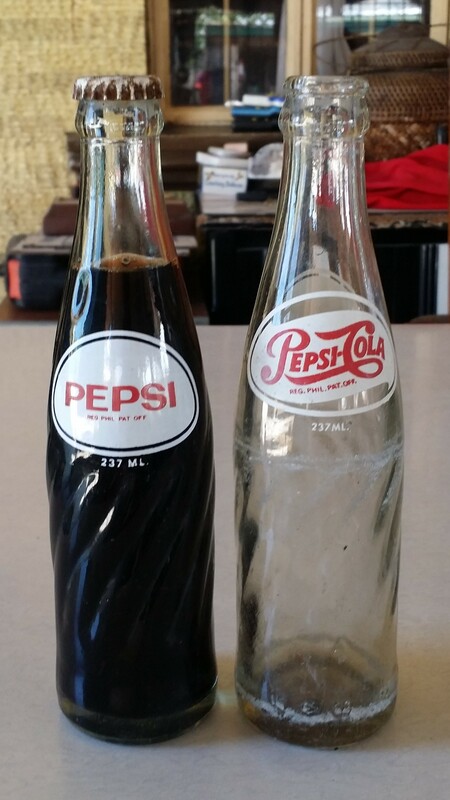 These Pepsi soda bottles I found came from an old warehouse. 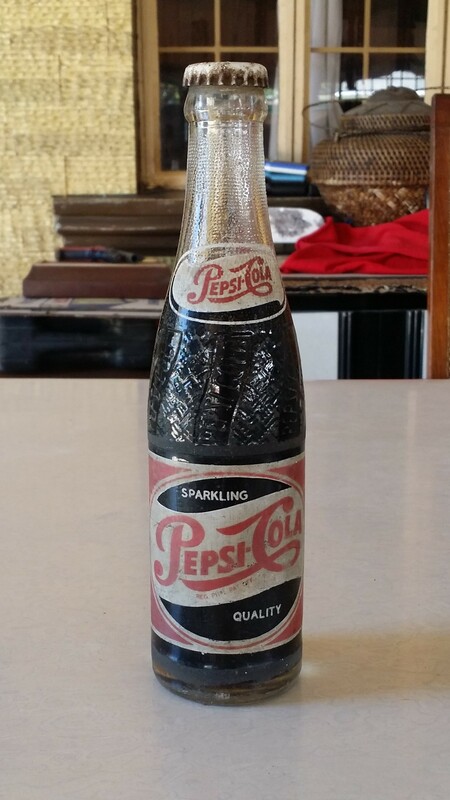 The owners were distributors before of Pepsi Cola Brands in our area. They were a friend of my family. I asked my dad to talk to his friend if I could visit their old warehouse to see if there is any old bottle that I can find. Gladly the friend of my dad allowed me to visit his warehouse. While in his warehouse I kept on looking for some old bottles and everything that I found has a crack or shattered ones. Then in a corner a found a pile of broken bottles and inspected them thoroughly. It was a good thing that I did that. because as I was inspecting it the first thing I found was an old Pepsi bottle that has its contents still intact. 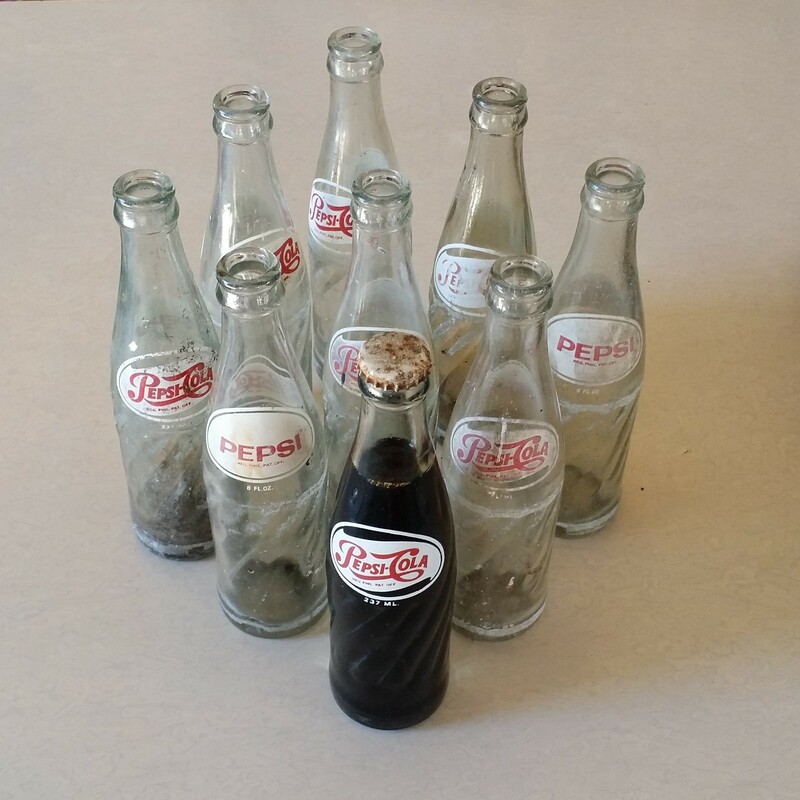 Then I still dug and inspected the pile of broken bottles until I found 8 more vintage Pepsi Cola Bottles still intact. Since I got 9 more bottles I decided to stop and call it a day. I asked the friend of my father how much he wants for it. He just said that since you are the son of my friend I will just give it to you instead. He also said that he has no use for it anymore and I can just add it to my collection since my father said to him that I collect old bottles. I said thank you and I am very grateful for giving the Pepsi Cola Bottles to me. I then left and went home to add the old bottles to my collection. The third one that I got has the same bottle but the design of the logo are both different. I think that these 2 bottles are from the early 90’s up to the present. 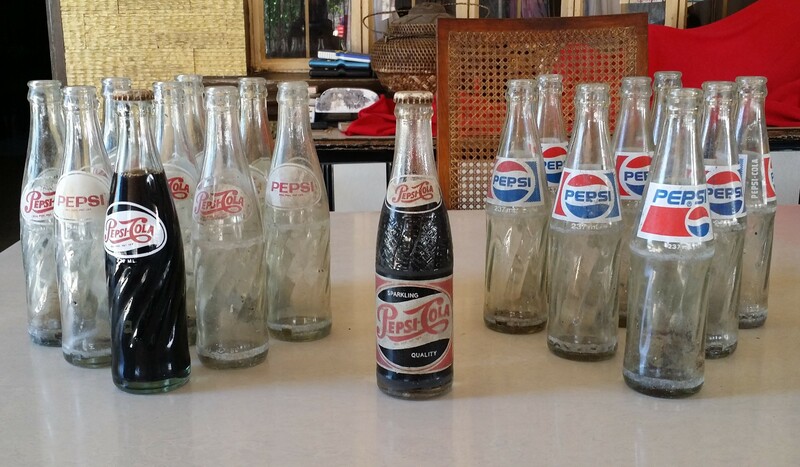 I know that they are not yet vintage Pepsi Cola Bottles but it never hurts to add them in a collection. I was able to get these bottles thru my junkshop and many people still do sell them to me. These 2 bottles cans till be found pretty easily and i think that I have at least 6 cases of them. I just forgot to take a picture of them. The first Vintage Pepsi Cola Bottles wooden case that I got is colored yellow. I didn’t know what year it was used. But I know that this is much older than the blue one. It was brought to me by one of my magbobote (worker.) He said that he found it on a dumpster. I gladly bought it from him. The wooden case was still in good condition. there were just some chips on the some parts of the wood. Due to its age I do consider it as an awesome find. 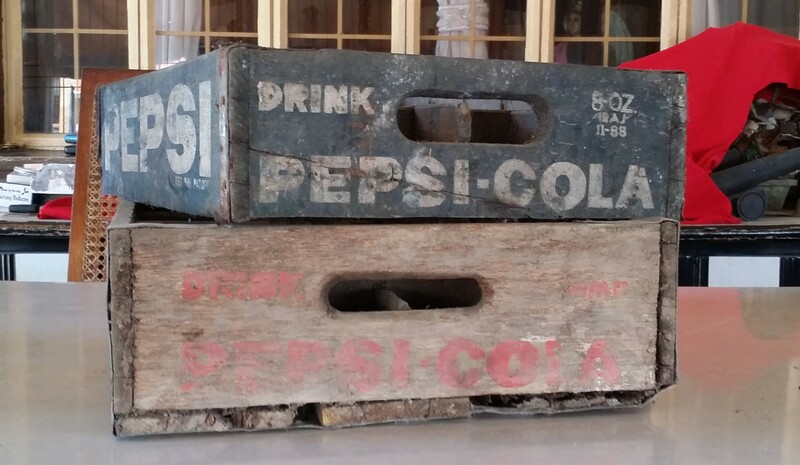 the second vintage Pepsi Cola Bottles wooden case that I got is colored blue. It was brought to me by one of the garbage man in our area. He said that he was able to get a hold of it because one of the homes that he services in our area gave it to him. The owner said that he can use for firewood. Since that is how he cooks his food and rice. Luckily one of his friends said to him that I was looking for some wooden soda cases. And that was why he brought it to me. I gladly bought it for a price that we agreed upon. The only problem in the wooden case is the wood underneath it. All the wood was missing but luckily the sides are still intact. I will just ask one of our workers who is also a carpenter to restore the wood underneath it. 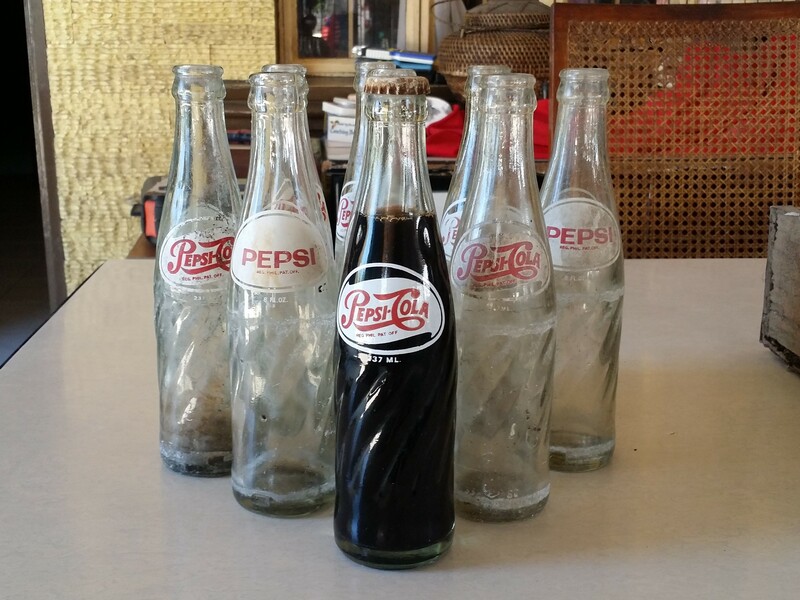 All in all I am very happy and lucky to obtain this collectible vintage Pepsi Cola Bottles. I hope that I can still find more of them to add to my collection. And be able to preserve it so that the future generations can also see it. 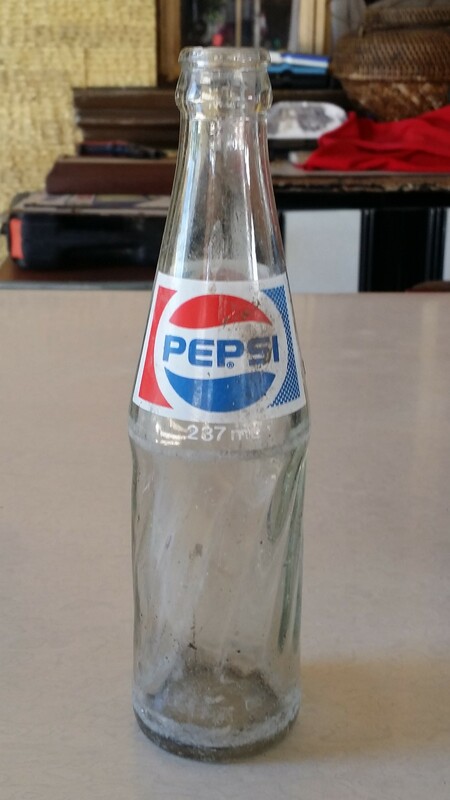 Hi, can you please tell me the exact height of the 1990s Pepsi bottle? The one that is third from the left in the picture of four bottles? I see these unopened Pepsi bottles that look very similar for the date is pictured here at my local laundromat that is mainly run by Spanish people. They are always available and they cost the same as a regular soda matter of fact they don’t even have anything but these type of bottles I don’t understand it how they continue to restock and get these unopened bottles for sale to the public at a dollar, or a dollar 25 tops. I live in Immokalee Florida about 40 miles east of Naples Florida it is a farming town known for his produce tomatoes is the biggest prop. As well as oranges but mainly vegetables. They drink them and then just throw them away in the garbage can there while they do their laundry just like any other bottle.